Better onboarding practices for your graduate teachers need an Onboarding Checklist. Download yours today. Those graduates that do pursue a teaching career bring a great deal of promise: high levels of enthusiasm; optimism; fresh ideas; and contemporary knowledge of current educational theory. However, research shows that once they embark upon their first teaching position at a school, they often begin to feel overwhelmed by the challenges of the profession. And without access to support – on a professional and personal level – they become disillusioned and start to reconsider their futures. Australian schools are now looking to better onboarding practices in an effort to increase retention rates of graduate teachers and equip them for the multifaceted requirements of their roles. New teachers that are sponsored early in their career with professional learning opportunities, expert mentoring and performance feedback have been shown to be more effective. Onboarding also improves socialisation of staff by connecting them with peers, helping new teachers establish professional networks, and integrating graduates into the school’s community and culture more quickly. In 2016, the Australian Institute for Teaching and School Leadership (AITSL) developed a groundbreaking set of guidelines for teacher onboarding, Graduate to Proficient: Australian guidelines for teacher induction into the profession. These guidelines are a significant departure from traditional induction programs and embrace the dynamic principles we have come to associate with modern onboarding. access to lots of useful, practical information and resources. 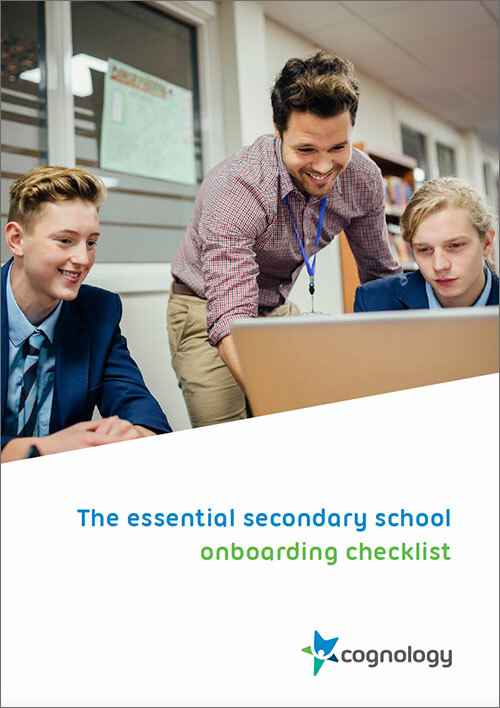 In fact, onboarding can and should be made available to the entire school workforce irrespective of whether they are engaged on a permanent, part-time, temporary, casual or volunteer basis. A checklist is a great tool to map out what you need to cover off over the new teacher’s onboarding period. Your checklist should not list absolutely every tiny detail. (See our article “Onboarding Problems? – Keep Calm and Make a Checklist) But a concise checklist will make sure that important items don’t get overlooked. Professional Identity and Wellbeing – Steps for introducing your new teacher to their colleagues, the school leaders and the facilities. Initiatives to help them adapt to the way the school operates, the working arrangements, timetables, and how you communicate. And linking new staff to people and resources they can turn to for help and advice. Professional Practice – Sharing the ethos of your school including your guiding principles, vision, values and standards you uphold. Establishing expectations and setting goals early with the new teacher to help focus their energies and fine tune their professional development. Orientation (Compliance) – Covering off regulatory items and policy and process that govern the ways staff work.